Jeanne Longsworth opened Longsworth Law LLC in 2007. Prior to opening her own firm, Jeanne was a partner and practiced for more than 20 years at one of Indiana’s largest law firms. 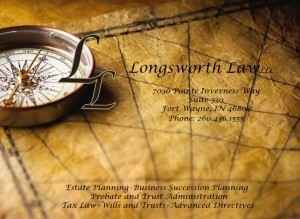 Longsworth Law LLC is located in Fort Wayne, Indiana and serves clients throughout the State of Indiana.